Never underestimate the power of an attention-grabbing subject line. When it comes to emails, readers really do judge books by their covers. In fact, 47% of email recipients say they decide whether or not to open an email solely based on its subject line. Avoiding the spam folder is one thing, but knowing how to truly stand out in an overly crowded inbox is quite another. Being in tune with your email readers not only increases click-throughs, but also increases the likelihood of repeat purchases, higher brand loyalty and could increase your company’s ROI by 4,300%. Read on to discover the mechanics behind successful email openers with Wordsmith’s top 5 tips to creating the ultimate clickable email. With typical inboxes displaying around 60 characters of an email's subject line, and some mobiles showing just 25 to 30 characters, it’s ideal to get straight to the point in about six to eight words. Succinct and snappy copy matters more than ever before, as 68% of email opens are now taking place on mobile, meaning your copy needs to be clear and most importantly, easily scannable. However, embracing brevity doesn’t mean you have to sacrifice creativity – far from it. The best subject lines tend to avoid clichés (like the plague) and create enough intrigue to entice readers to click through. Research shows that short subject lines in the charity, publishing and events sectors not only get higher open rates but also more responses from their recipients. According to data collected by Yes Lifecycle marketing, personalizing email subject lines can dramatically increase open rates by up to 50%, and lead to 58% more click-throughs. However apart from using the recipient’s name, successful companies are looking further into brand engagement, browsing behaviour, purchase history, abandoned baskets and loyalty programme status to tailor the content to meet the needs of the specific end user. 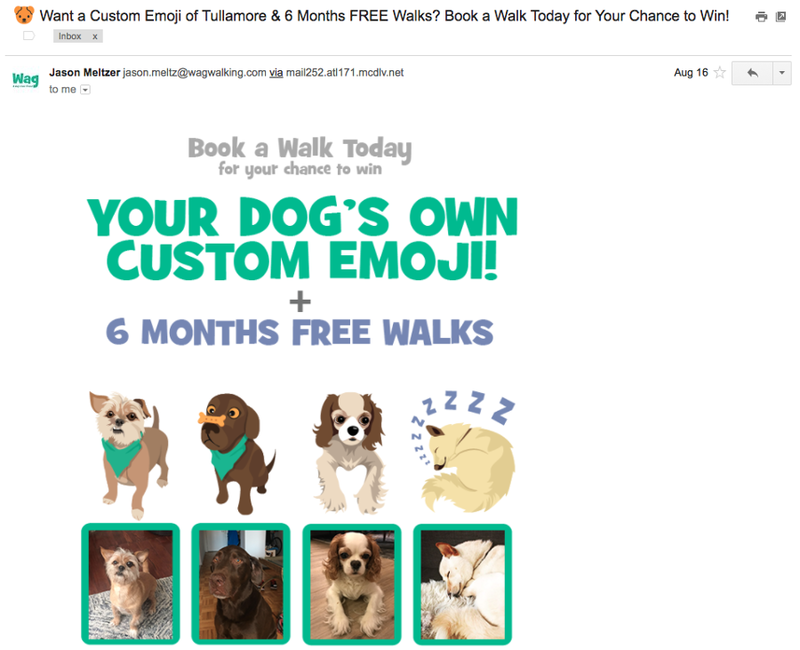 Dog walking company Wag knows the way into their consumers’ hearts – which is why they offer to create a personalized emoji of their most-loved pooches, along with an exclusive offer that encourages them to open the email and make a booking! Apart from personalizing your favourite pets, other companies have chosen to combine personalization with location targeting and timing, further maximizing open rates. For example, Starbucks offers latte discounts during morning commutes, and bars send emails to consumers at 6:45pm promoting their happy hour. It’s all about hitting your recipients with the right copy at the right time. 3. Up the urgency with action-oriented verbs. You should view your subject line as an overarching call to action. The language must encourage the reader to engage with your brand, and this starts with adding vibrant verbs that instill a sense of urgency and excitement. If readers believe they only have a small window of time to take action, they are more likely to follow through. If you have a lot of information in the body of the email itself, email marketing experts say that including a deadline for your proposition exponentially increases the response rate. Phrases like, “limited availability”, “ending soon” or “last chance” all convey the fact that this exclusive offer won’t be around for much longer, increasing the Fear Of Missing Out (FOMO) within your target audience. Facebook Messenger Bot Expert, Nico Moreno, recommends to “just pick one of your recipient’s goals, hopes, or dreams, and dangle it in front of them, explicitly showing them what they’re missing out on, and how they can get it now by taking the action you want”. UK marketing automation tool GetResponse uses scarcity to encourage higher click-throughs. By stating there are “only 500 accounts left”, audiences believe this deal is in short supply – and if they don’t act quickly enough, it could be gone for good. All marketers know the value of rewarding loyal customers –give a little to get a lot back in return. Rewarding loyalty is important, as it boosts a sense of belonging and exclusivity. When consumers feel like they're on the inside and valued for their contribution to your brand, these groups of people are more likely to be compelled to act – ultimately leading to better email conversions. Even if you’re not giving out freebies, the right phrasing and/or discounts can have a similar effect of making your customers feel special – for example “Exclusively for you”, “You’re invited” or “Our loyal customers save 40% this week”. Starbucks does this well. Their simple but effective subject line: “You’ve earned a free drink or food item this week” adds personalization with “you”, increases urgency by adding a time limit of one week, and throws in a freebie in upfront to thank you for being a loyal customer. Who wouldn’t want to open that email? Avoid following the herd by sending out vague statements you hope will spur a call to action. If your subject line isn’t crystal clear or doesn’t pique curiosity in the reader, your content will most like fall on deaf ears. One way to give a bit of clarity to your subject headlines is by using numbers. People like to know what they’re in for when they open your email, so if you’ve digested and quantified the information before they click through, they know roughly how long they will have to spend reading it. This is one of the reasons why people love top 10 listicles. We like to lump key information into groups, preferably in round numbers as the main takeaways. No matter if your number refers to listicles, a discount, or the number of days left on an offer, people will always be more likely to respond to clear, concise messages. Done right, email marketing can be one of the best tools in your marketing arsenal, and it all begins with a powerful subject line. Creating crafty subject lines that effectively capture a prospect’s attention not only encourages them to open your email, but gently nudges them further down the purchasing pipeline. Remember, a few words can speak volumes.